Portugal; 8Health Sciences Department, Portuguese Catholic University, Viseu, Portugal. 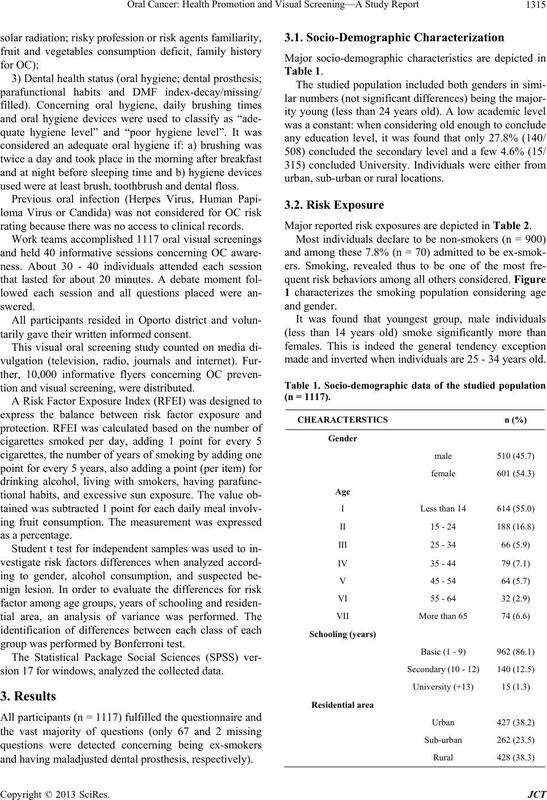 population knowledge, sensitization and visual screening. an overall of 2.8% of all cancers 2,3. OC is around 50% - 60% 4. tients is severely affected 4,6,7. years (at least 10) after smoking cessation 11. approximately 75% of upper aero digestive tract cancers. with oral microorganisms is recently under investigation. been shown to be associated with reduced OC risk 18-21. body part are not diagnosed until late stages of disease. understan d dete rminants for OC development . posed with at least 1 dentist and 4 dentistry students. used were at least brush, toothbrush and dental floss. rating because there was no access to clinical records. tarily gave their written informed consent. tion and visual screening, were distributed. group was performed by Bonferroni test. sion 17 for windows, analyzed the collected data. and having maladjusted dental prosthesis, respectively). urban, sub-urban or rural locations. Major reported risk exposures are depicted in Table 2.
made and inverted when individuals are 25 - 34 years old. studied population (n = 1117). admitted to perform regularly oral self-examination. found in the studied population is presented in Ta b l e 3.
pected lesions or benign pathology (n = 1117). ferent from urban (p = 0.01). is already present at young ages (less than 14 years old). in the population studied 28. severe ethylic habits increased significantly. Figure 2. 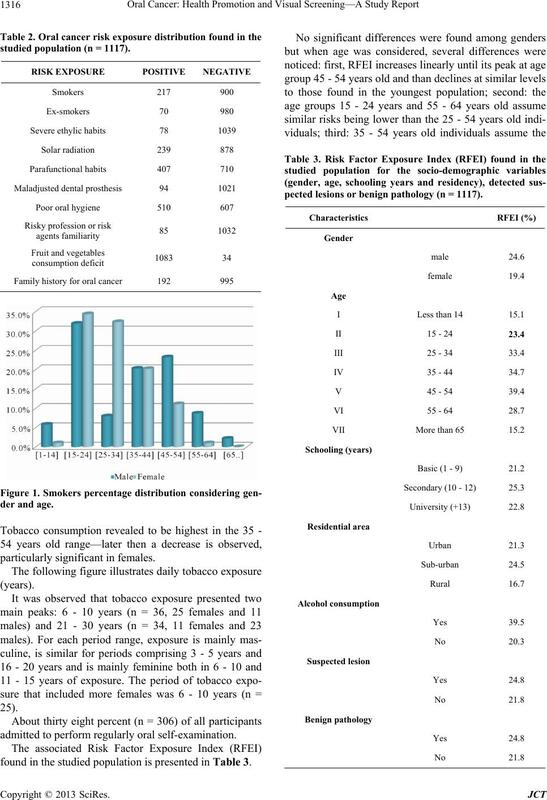 Tobacco exposure (years) considering gender. 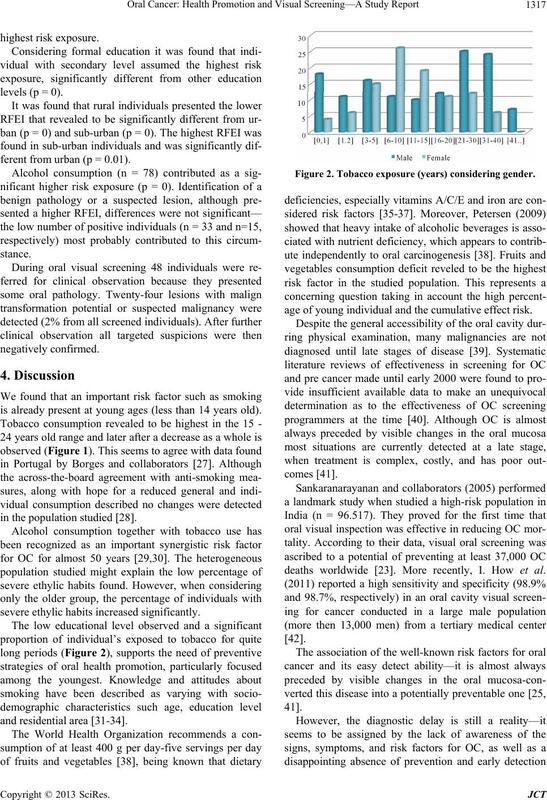 age of young individual an d the cumulative effect risk. deaths worldwide 23. More recently, I. How et al. visit a dentist regularly further increases its burden risk. activating the dopam i nergic r ewar d system 44. risk factors have a cumulative effect. get the core of OC health promotion. tion sensitization and visual screening. the Portuguese High Commissioner for Health. Vol. 46, No. 6, 2010, pp. 407-410.
cology, Vol. 4, No. 1, 2012, p. 1. Vol. 82, No. 7, 2007, pp. 878-887.
thology & Medicine, Vol. 39, No. 4, 2010, pp. 299-305.
tal Research, Vol. 21, No. 3, 2010, pp. 316-319. No. 6, 2010, pp. 431-465. Oral Pathology, Oral Radiology and Endodontology, Vol. 98, No. 5, 2004, pp. 546-552. No. 5, 2011, pp. 400-407. 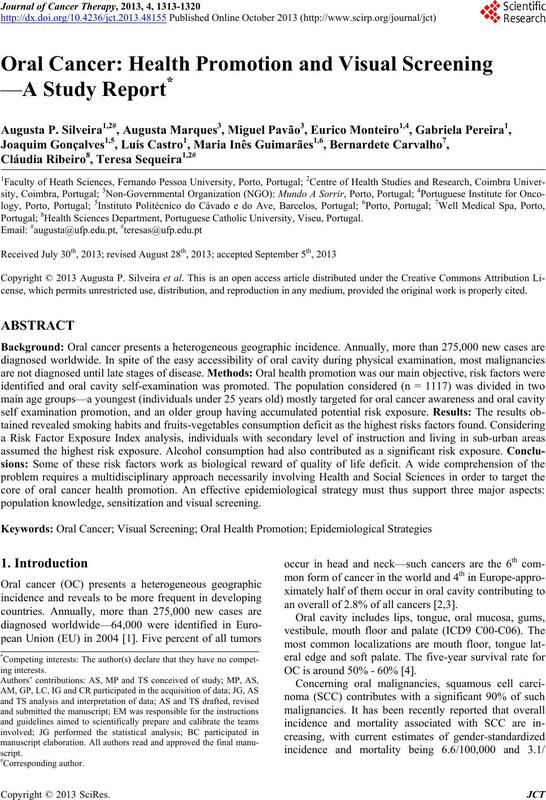 Oral Oncology, Vol. 40, No. 2, 2004, pp. 207-213.
ogy, Vol. 23, No. 6, 1994, pp. 1137-1144. Vol. 42, No. 10, 2006, pp. 957-964. Oral Cancer,” Oral Oncology, Vol. 46, No. 6, 2010, pp. Vol. 66, No. 6, 2008, pp. 321-326. Based Dental Practice, V ol. 1 0, N o . 4 , 2 0 1 0, p p . 2 2 3-224. 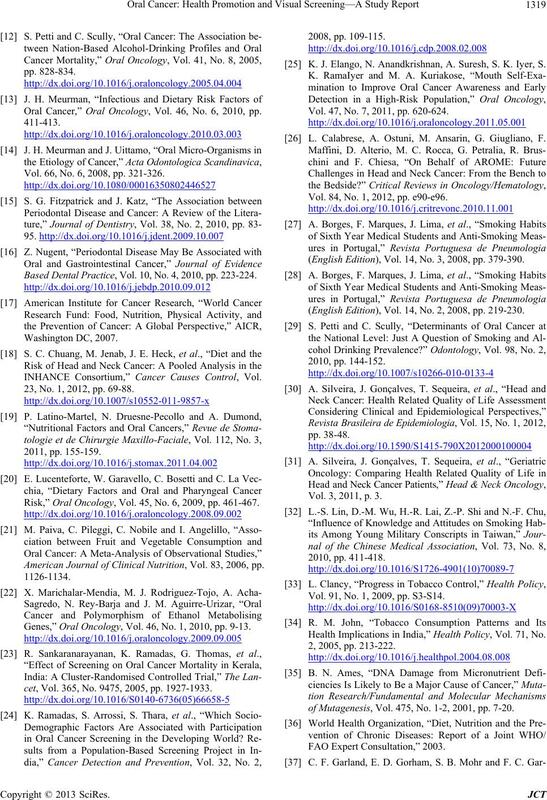 INHANCE Consortium,” Cancer Causes Control, Vol. 23, No. 1, 2012, pp. 69-88. 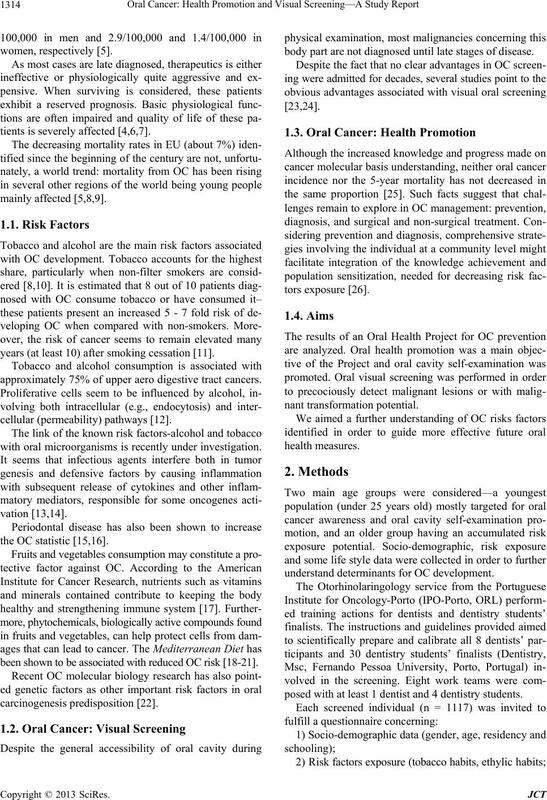 Risk,” Oral Oncology, Vol. 45, No. 6, 2009, pp. 461-467. 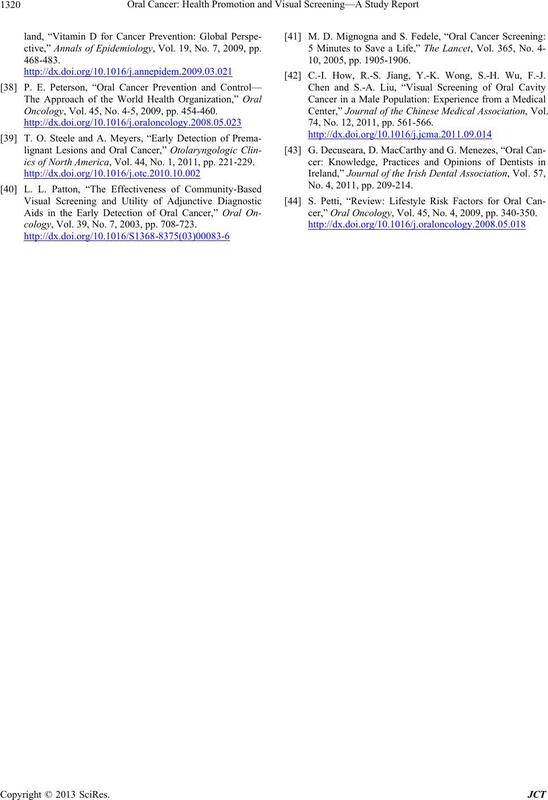 American Journal of Clinical Nutrition, Vol. 83, 2006, pp. Genes,” Oral Oncology, Vol. 46, No. 1, 2010, pp. 9-13.
cet, Vol. 365, No. 9475, 2005, pp. 1927-1933. K. J. Elango, N. Anandkrishnan, A. Suresh, S. K. Iyer, S.
Vol. 47, No. 7, 2011, pp. 620-624. L. Calabrese, A. Ostuni, M. Ansarin, G. Giugliano, F.
Vol. 84, No. 1, 2012, pp. e90-e96. (English Edition), Vol. 14, No. 3, 2008, pp. 379-390. (English Edition), Vol. 14, No. 2, 2008, pp. 219-230. Vol. 3, 2011, p. 3. Vol. 91, No. 1, 2009, pp. S3-S14. Health Implications in India,” Health Policy, Vol. 71, No. of Mutagenesis, Vol. 475, No. 1-2, 2001, pp. 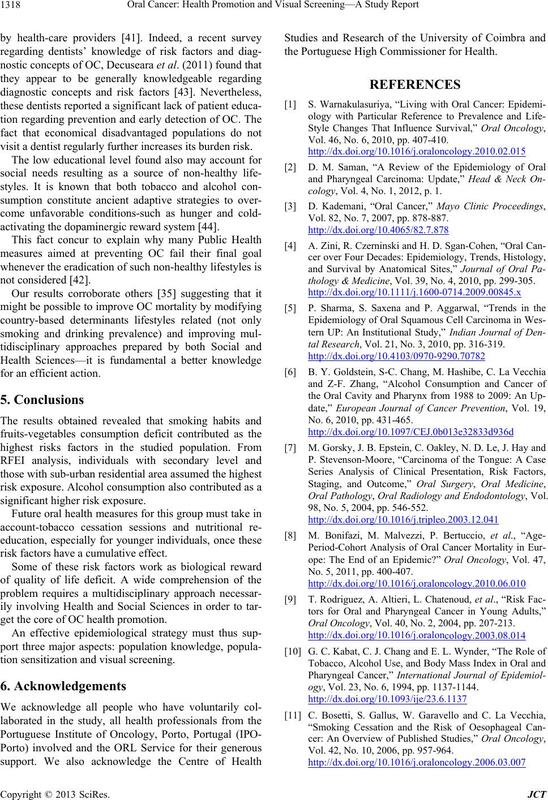 7-20.
ctive,” Annals of Epidemiology, Vol. 19, No. 7, 2009, pp. Oncology, Vol. 45, No. 4-5, 2009, pp. 454-460.
ics of North America, Vol. 44, No. 1, 2011, pp. 221-229.
cology, Vol. 39, No. 7, 2003, pp. 708-723. C.-I. How, R.-S. Jiang, Y.-K. Wong, S.-H. Wu, F.-J. Center,” Journal of the Chinese Medical Association, Vol. 74, No. 12, 2011, pp. 561-566. No. 4, 2011, pp. 209-214.
cer,” Oral Oncology, Vol. 45, No. 4, 2009, pp. 340-350.